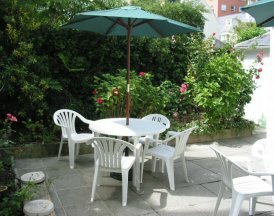 This budget hotel is conveniently located in a residential area on the west side of St Helier. West Park beach, in St Aubins Bay, is just a five-minute stroll away and the town centre shopping precinct is also within easy walking distance, on level ground. In the vicinity, there are over 50 eating places offering a wide variety of cuisine from around the world. This includes restaurants, cafés, take-aways, pubs and bars, some with evening entertainment. Close by are the Parade Gardens, the Peoples Park and Les Jardins de la Mer Waterfront gardens. Several nightclubs are 10 minutes walk away. 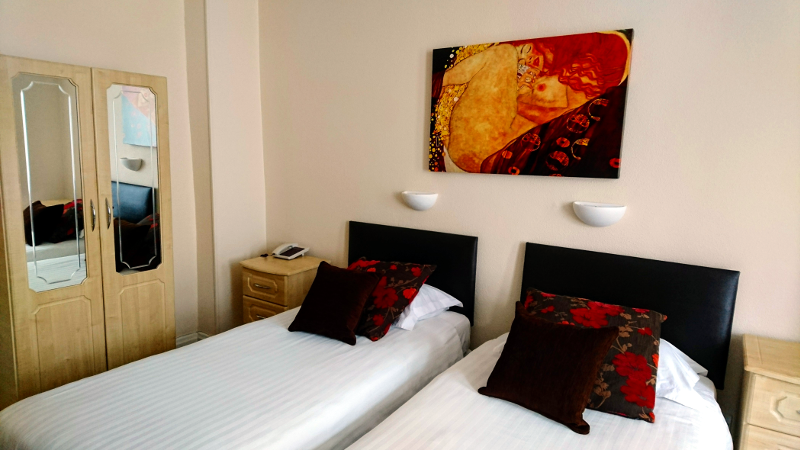 The Sarum Hotel offers a choice of single, double, twin or treble self-cater bedrooms, which each have a mini kitchenette in the bedroom plus an en-suite bathroom. Guests can opt for room only or bed and breakfast rates and twice weekly or daily room cleaning/servicing. For families and couples needing more space, the Hotel has some one and two-bedroomed self cater suites in an adjacent property. 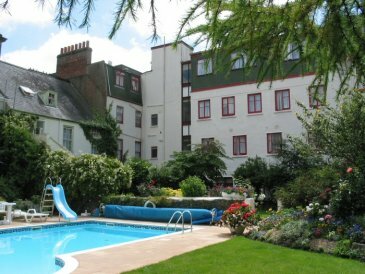 Both the hotel bedrooms and the larger bedroom suites have direct access to the pleasant secluded garden with its outdoor swimming pool, the ideal place to relax and unwind. Please note that we are a limited services hotel. This means, amongst other things, that we service your bedroom or suite twice weekly unless you opt to pay extra for daily servicing. 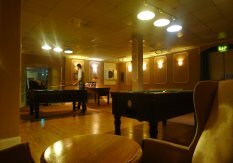 For guests' use, there is a residents' bar and a large recreational lounge with several pool tables, games machines and two large plasma TVs. 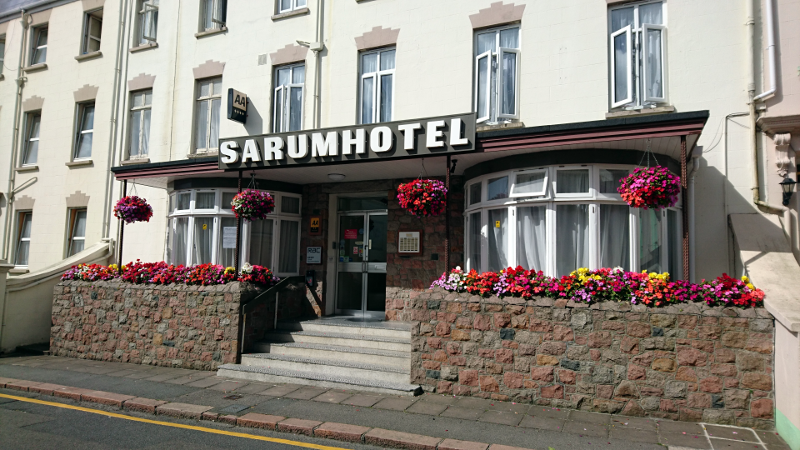 The Sarum provides a comfortable hotel base for visiting Jersey to enjoy a dining out experience. 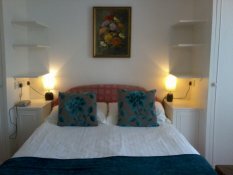 Self-cater bedrooms & small suites We have single, double, twin and treble self-catering bedrooms. Trebles are small suites. 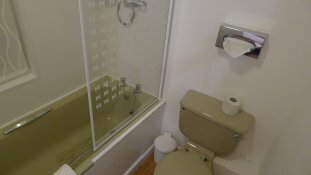 All bedrooms have en-suite facilities. Doubles for sole occupancy are subject to availability. 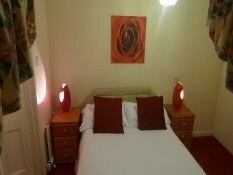 Bookings must be for a minimum 3 night stay and may start on any day of the week. 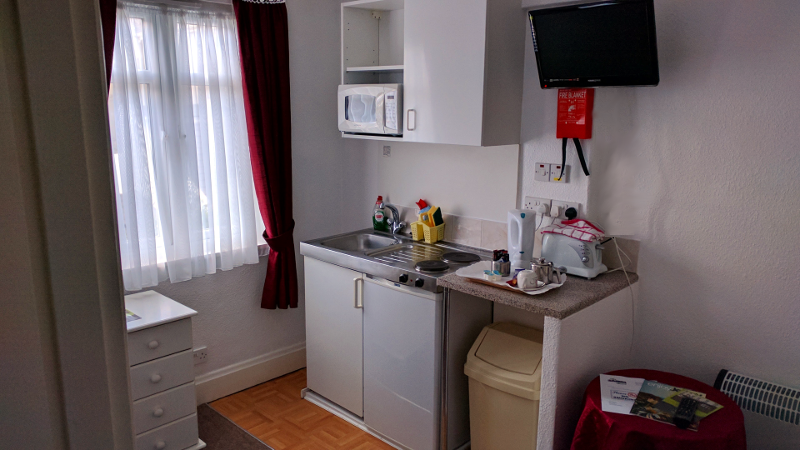 Because of the mini kitchenette units in most bedrooms, there are only a limited number of bedrooms that can take children. For treble occupancy of the small suites, there is a supplement of £14 per day for the third adult and £7 per day for a child. 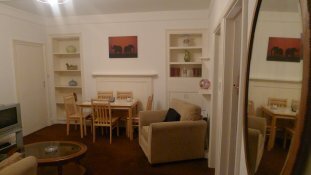 Self-cater suites We have a selection of one and two bedroomed self-catering suites. 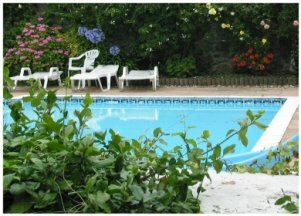 Bookings during the summer season must be for a minimum of 7 days and must start and finish on a Saturday. During the shoulder months and winter, 3 or 4 night stays may be accepted on request but must start or finish on a Saturday and each night is charged at one-fifth of the weekly rate. 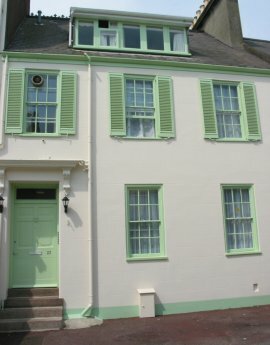 On making a reservation, we would require a payment of 30% of the total cost and the remaining amount would be due eight weeks prior to your arrival.. On arrival, clients will be required to lodge a surety deposit of £200 but this will be refunded on (or as soon as possible after) departure provided that the accommodation is left in a reasonably clean and undamaged state with full inventory. This surety deposit can be included with the settlement of guests holiday accounts or paid on arrival by cash, credit card or guaranteed cheque. Children are accepted. All bookings are received on a request basis and should not be considered as confirmed until a formal acceptance has been received in writing. Reservations can be made by telephone, between 8am & 9pm, daily, or by fax, by e-mail or on-line through our website at: www.jersey.co.uk/hotels/sarum However, should there be no availability showing on-line for your preferred dates, please phone or e-mail us to check for expired options or cancellations. DEPOSITS & ACCOUNT PAYMENT The account balance is payable EIGHT weeks prior to arrival, failing which the management reserves the right to re-sell the accommodation without further notice. In the case of late bookings, the whole account is payable at the time of booking. Most credit cards are accepted. Personal cheques will only be accepted if presented seven clear banking days before departure, or if covered adequately by a suitable cheque guarantee card. COTS Cots and cot linen are available at a cost of £5.50 per day. TRAVEL-TIMES Incoming guests should check-in at the Sarum Hotel reception but should please telephone 01534-758163 to advise estimated arrival time, as the reception desk is not always manned. Check-in time for suites is from 3pm on the day of arrival. 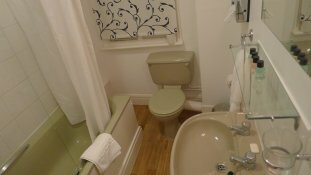 Bedrooms and suites should be vacated by 10am on the day of departure but Hotel shower and WC facilities are available until departure. Taxis are available at both Harbour & Airport. PETS We regret having NO facilities for dogs or other pets. CAR-HIRE AND EXCURSIONS We deal with a reputable car-hire firm & can also arrange Island coach-tours and excursions to the other Channel Islands or to France. But dont forget your driving licence and passport! PARKING Limited parking is available on a first-come, first-served basis. If a private place is required, it may be requested in advance but cannot be guaranteed. Where a private parking space can be allocated, the charge is £5.00 per day (payable on arrival). Public street parking is available 150m from the property. Bicycles can be stored at the hotel at no charge. ROOM CLEANING Please note that we are a limited services hotel. 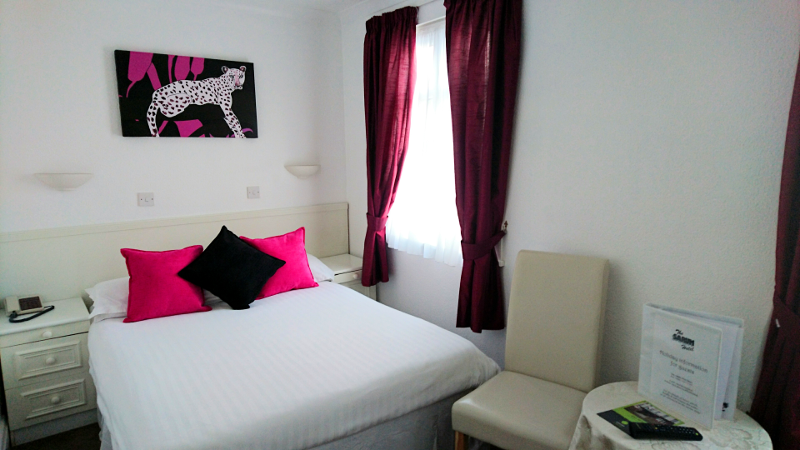 This means that we service your self-catering bedroom or suite twice weekly. If you would prefer daily servicing of your accommodation, the daily tariff would increase by £3.50 per bedroom or £6.00 per suite per day extra. SERVICE CHARGE is NOT added to accounts. Gratuities are at guests own discretion. GOODS AND SERVICES TAXin Jersey is applicable at a rate of 5% on all accommodation and all services. MEALS Full English breakfast is available at a supplement of £8.00 per person per day. Continental breakfast costs £6.50 per person per day.If you wish to have breakfast, you must request it the night before. 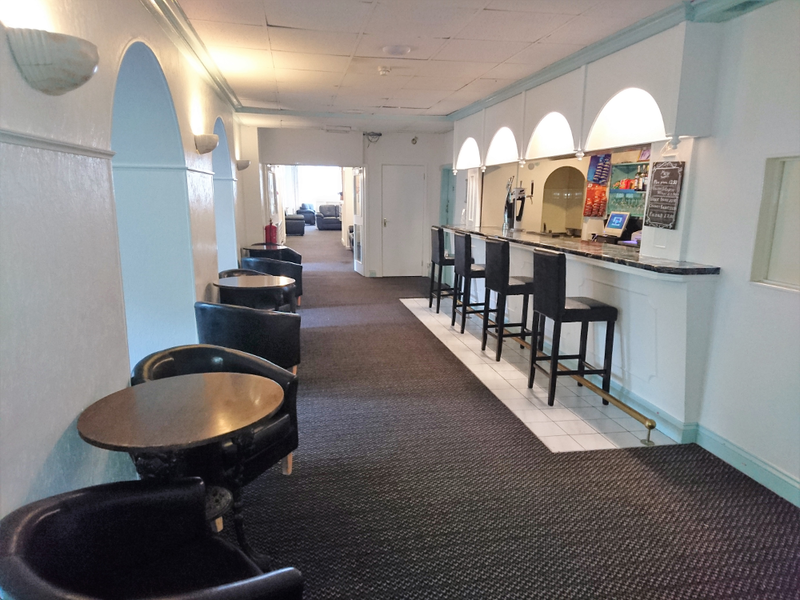 The Sarum does not serve lunches or evening meals, although snacks are available from the bar in the evenings. 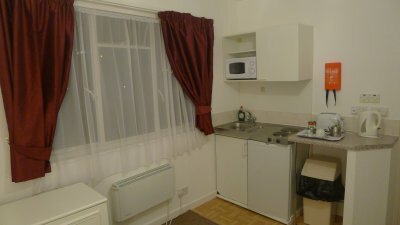 Single, double, twin or treble bedrooms, each with kitchenette unit on one side of bedroom (kitchenette unit consists of microwave, hob, sink, fridge, cupboard, crockery, cutlery & utensils); table & 2 chairs; bathroom consists of shower or bath with shower in it, hairdryer, washbasin & toilet. Please note that we are a limited services hotel. 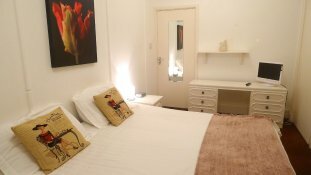 This means that we service your self-catering bedroom twice weekly. If you would prefer daily servicing, the daily tariff would increase by £3.50 per bedroom. 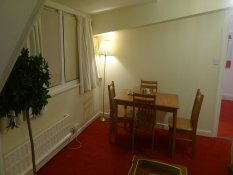 Double or twin bedroom with en-suite bathroom, very small sitting area and very small kitchenette. 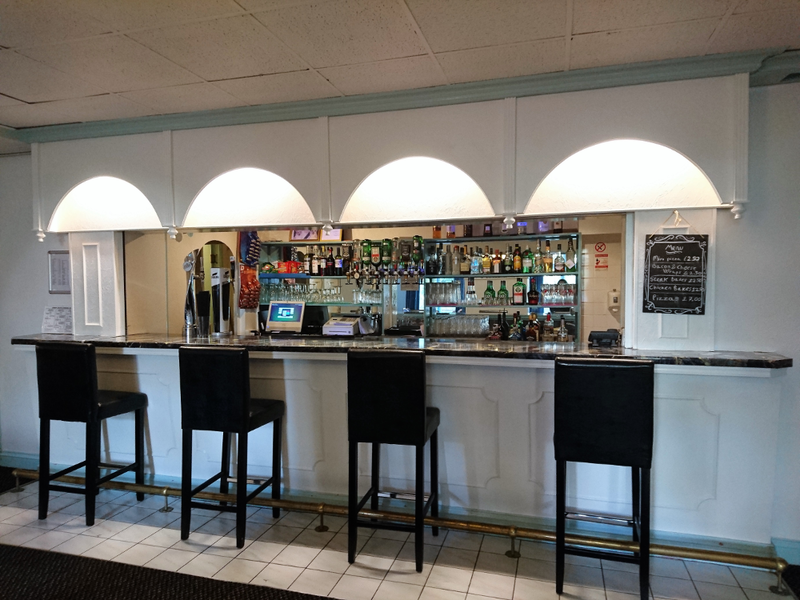 Suite 118 is located in an annexe adjacent to the rear of the Sarum Hotel and can be accessed either at first floor level from the hotel, or from the fire escape at the rear of the property. 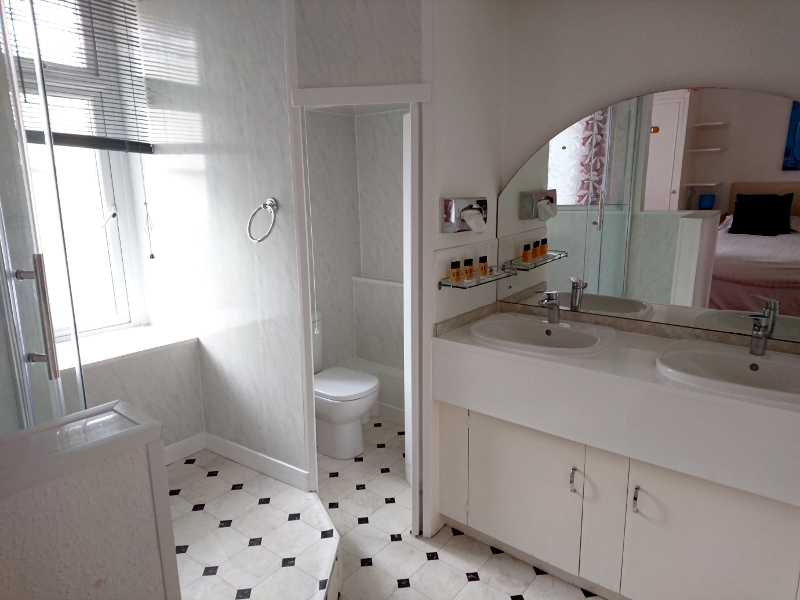 Large double bedroom with double bedsettee, dining table & chairs and UK digital television, separate full size kitchen; bathroom (with bath and integral shower, washbasin and toilet), large balcony facing south with table, chairs & parasol. 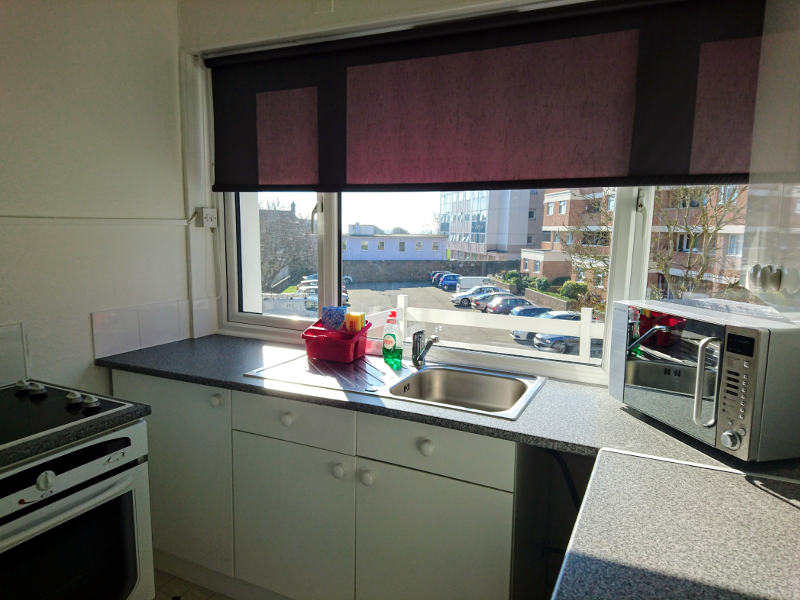 Each kitchen contains a full size oven & hob, microwave cooker, fridge/freezer, dishwasher, washing machine, kettle, toaster, kitchen utensils, crockery & cutlery. 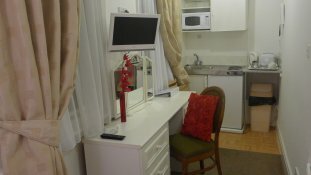 An iron, ironing board, vacuum cleaner and hairdryer are also provided. Each lounge has a double bed-settee and an armchair, a dining table & chairs and a wide-screen television with UK digital channels available. 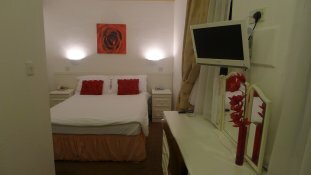 Each bedroom also has its own television with UK digital channels available. Cots (incl. linen) & high-chairs are available, on request - weekly charges (payable on arrival) are: £22 per cot & £7.50 per high-chair. 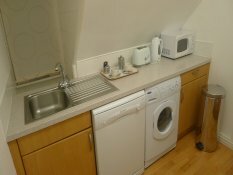 The accommodation is cleaned twice weekly, including changing bed linen and towels. The property has no lift and there are 4 steps up to the front door. It is not therefore disability-friendly. The property has a fully integrated fire-alarm system. Limited car parking is available on a first-come, first-served basis. If a private parking space is required, it may be requested in advance but cannot be guaranteed. Where a private parking space can be allocated, the charge is £35.00 per week (payable on arrival). 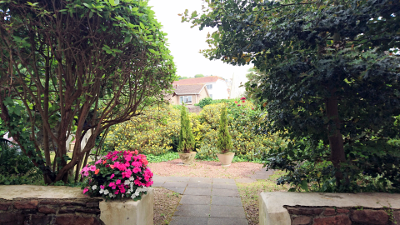 Public street parking is available 150m from the property. 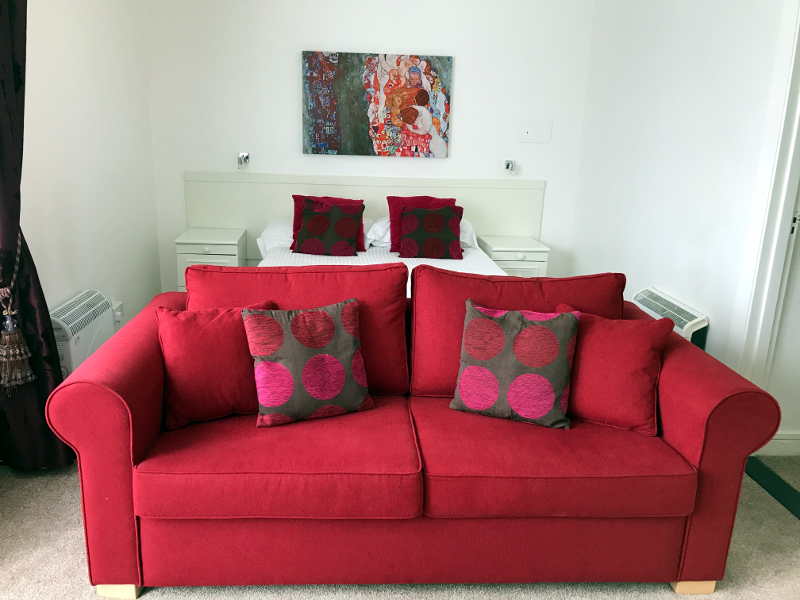 All accommodation charges include electricity, hot water, electric panel heating, cleaning materials, twice weekly cleaning and linen & towel change. Guests are responsible for purchasing their own food and drink. Breakfast is available on request the night before, at a cost of £8.00 per person per day. Breakfast is served in the main hotel building. 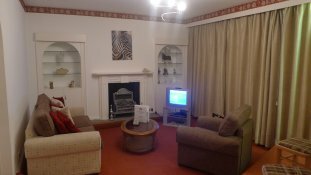 Lounge with double bedsettee, 2 armchairs, dining table & chairs; separate kitchen; 2 bedrooms (one with 46 double bed, the other with two single beds); shower-room with washbasin & toilet (note: no bath). Open-plan lounge with integral kitchen and bar dining area; open-plan double bedroom & bathroom (with bath, shower, twin basins & toilet). 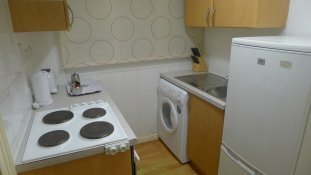 Lounge; kitchen; bedroom (with 46 double bed) & bathroom (with bath, shower, washbasin & toilet). NB: bedroom has sloping ceilings.